I used to think that breakfast was all about cereal and toast. Something simple, maybe including fruit or orange juice Now, don’t get me wrong, I still love this type of breakfast and enjoy it many times a week. Home made whole grain breads, nut butters and granola, fresh seasonal jams and honey, a good creamy yogurt-each offers a delightful, energy-giving and satisfying start to the day. However, when I have a little more time, or a lot more appetite, I enjoy something else entirely. This breakfast will last the whole day, and is a colorful, flavorful, protein filled feast. It is also a unique and tasty way to get your whole grains. Once you have the basic formula, you can adapt this recipe to whatever is available seasonally, and/or whatever you have in your refrigerator. Heat 1 Tbsp olive oil and about 2 Tbsp of water in a large skillet-cast iron is my favorite for this. When hot, add sweet potato or squash, and cover to steam. After about 2-3 minutes, check them. They should be soft, but not mushy. Add another Tbsp oil, and stir in onion and garlic, and saute 2 minutes. Add broccoli and another Tbsp of water again to steam and mix well with other vegetables. 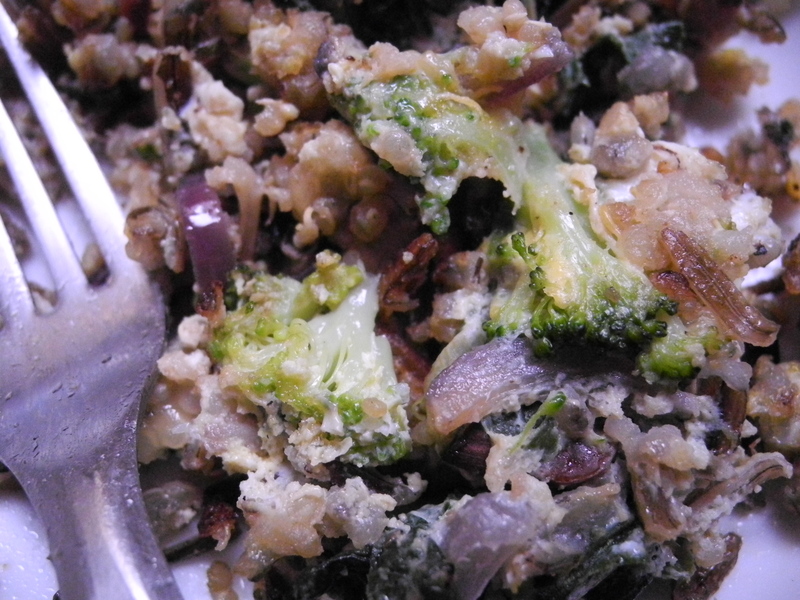 When broccoli is just bright green-about 2 minutes, add grains, and greens and combine well. Add another Tbsp of oil, and crack eggs over the top of the vegetables. Add salt, herbs and greens, and combine everything with a spatula, making sure to mix together well. Sprinkle cheese on top, and cover for 1-2 minutes. The cheese should begin to melt slightly while the eggs cook. Flip egg mixture over in segments to cook the other side. Cook for another minute or so, but try not to over cook. 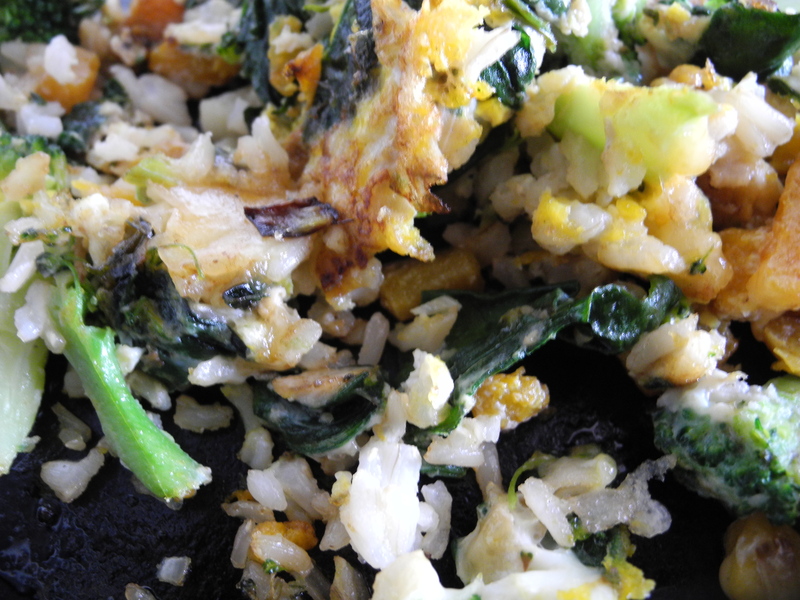 The texture should be firm, and all the vegetables should be tender, but moist. Allow to cool for a few minutes and enjoy. Tip #1 : I generally prepare a large batch of whole grains early in the week, and keep in the refrigerator for various uses. This makes cooking time from anything from stir fries and salads, to this breakfast considerably faster and also helps with meal planning. Tip #2: This recipe can be adapted and varied for any season. In spring, use early spring onions and greens, asparagus, and fresh goat cheese or feta. In summer, go crazy with different seasonal vegetables including carrots, peppers, cauliflower and a rich gouda, in fall enjoy the variety of tubers including squash, parsnips, and beets, and in winter warm up with potatoes, swiss cheese and late season brussels sprouts, collards or kale.